Doctor Zhivago worked for the CIA? Ours is not to question why, ours is but to do or...spy. The CIA is not the first organization that comes to mind if you mention the topic of publishing, but during the late 1950s the CIA printed Russian-language copies of Doctor Zhivago and distributed the books to Soviet citizens as part of a propaganda program. Working from over 130 recently declassified documents, authors Peter Finn and Petra Couvee describe how the CIA regarded the novel as a “literary weapon” in the Cold War. 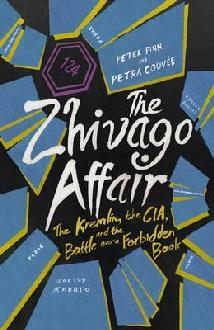 Their new book, The Zhivago Affair, is due out in June 2014. Boris Pasternak believed his novel would never be published because the Soviet authorities regarded it as “an irredeemable assault on the 1917 revolution.” Consequently he went to an Italian publishing scout and the novel was later published widely in the west. The CIA published a hardcover version of the book in the Netherlands, and printed its own paperback version, careful in both cases to avoid any association with the US. It also instructed operatives on how to use the book to engage Soviet citizens on the topic of communism versus democracy and freedom of expression. One internal memo shows that the CIA actively encouraged publishing the novel in as many languages as possible for maximum distribution throughout the free world, which in turn helped earn Pasternak his Nobel Price for Literature in 1958.